“I knew things were going to be difficult for Tennessee,” says Sid Sperry, director of public relations, communications and research at the Oklahoma Association of Electric Cooperatives. In 2007, Sperry — with the assistance of Steve Piltz of the National Weather Service office in Tulsa, Okla. — developed the Sperry-Piltz Ice Accumulation Index, or SPIA Index, a prediction tool that projects the footprint, ice accumulation and damage from approaching ice storms. Three days before freezing rain, trees and power lines began to fall on Saturday, Feb. 21, Tennessee co-ops were aware that the SPIA Index was predicting widespread damage, including a Level 4 event in part of the state. “A L­­evel 4 event means significant damage and prolonged power outages,” says Sperry. “Ice is different from tornadoes and thunderstorms,” says Aaron Hood, a service foreman for Volunteer Energy Cooperative in Benton. “In those types of events, you might have severe damage in some areas and no damage in others. But with ice, the damage is widespread. Hood left home on Saturday, Feb. 21, and did not return home until Tuesday, March 3, working about 16 hours each day. “We would work from daylight until 10 p.m. or midnight,” Hood says. The Feb. 21 event and another the previous week left their marks on Tennessee: more than $10 million in damage and 1,000 broken poles across the state. 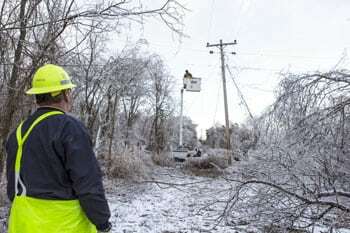 Some 500 lineworkers from Tennessee and surrounding states descended on the areas of greatest damage, working for days to restore service to co-op members. National Lineman Appreciation Day is Monday, April 13. In Tennessee, there are more than 700 co-op linemen who restore power during outages and maintain 86,000 miles of distribution lines and equipment. Linemen put their lives on the line every day to serve our communities. Help us tell them “Thanks!” by posting on Facebook or Twitter with the hashtag #ThankAlinemanTN. We will share your messages with co-op linemen across the state.